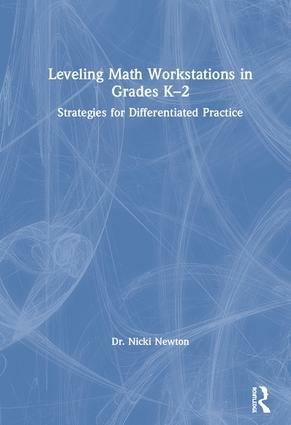 In this book from bestselling author Dr. Nicki Newton, you’ll learn how to level math workstations to engage K–2 students in meaningful, purposeful, rigorous practice. We know students don’t learn at the same pace, so how do we take into account where they are and differentiate instruction? Dr. Nicki has the answers, showing how leveled workstations are key in the formative years, how they help students operate in their zone of proximal development and how we can use them to help students progress to higher levels of math achievement. Each chapter offers specific examples, activities and tools. There is also a clear, step-by-step action plan to help you implement the ideas immediately in your own classroom. Dr. Nicki Newton has been an educator for 30 years, working both nationally and internationally with students of all ages. She has worked on developing Math Workshop and Guided Math Institutes around the country; visit her website at www.drnickinewton.com. She is also an avid blogger (www.guidedmath.wordpress.com), tweeter (@drnickimath) and Pinterest pinner (www.pinterest.com/drnicki7).